What costs less than $5, looks cool for a season, and falls apart when you think you need it most? Trendy jewelry. I’ve always liked the idea of accessorizing to really make an outfit pop, but I haven’t acted on that inclination in years. In high school, I had a dozen sweaters I circulated through and each sweater had a corresponding pair of earrings. And there were sequins – on both the sweaters and the earrings. Looking back, I’m slightly mortified. I mean, we’re talking seventeen-year-old Emily. Seventeen and sequins everywhere. I know some like their accessories, so in line with what I’ve said about trends, keep it if you love it and if it adds value. But I challenge you to go to your jewelry box right now and see if there are pieces that you just have “in case.” My guess is that there are some. 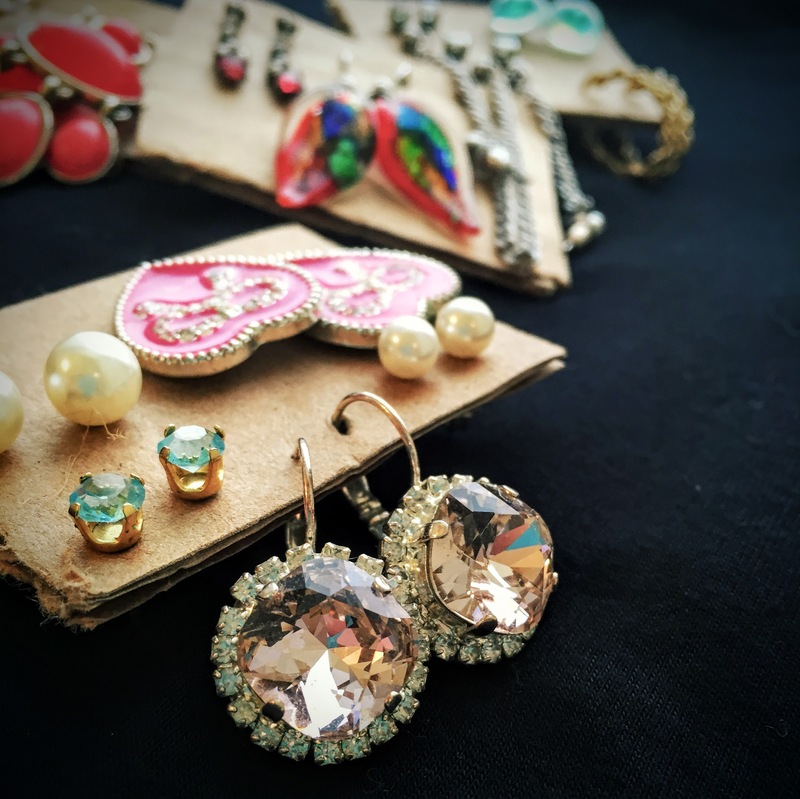 Earrings are my bling of choice, but even then I only have one or two pairs that I wear on a regular basis. These are my treasured wedding earrings that a dear friend made for me. I’ve started to see jewelry, much like makeup, as less of the star of the show and more like a supporting character. I use it as a way to compliment what’s already there. Earrings are my go-to piece, and most days I keep it super simple with just (fake) diamond studs. I don’t even wear earrings in my double piercing or my cartilage piercing anymore. Mostly because I forget. I think we tend to use jewelry as more than just a complement to our clothing. We wear it as a sign of social status, as a way of self expression, and (my favorite) because “everyone is doing it”. It has become a powerful social barometer to measure just how in touch we are with trends. The good news is that no one will call you out if you’re wearing something understated, simple, or even not at all. What will grab attention is if you’re wearing something you clearly look uncomfortable in. And when it comes to sentimental pieces (which is most of my collection), I wear them when I want to. They don’t even really have to match – for me, I love looking in the mirror and being reminded of the memory that each one stands for. Those memories make me feel more beautiful than the jewelry alone does. Earrings are a tough one, but I’ve arrived at what I think is about 1/3 of what I used to have. Bracelets – I don’t wear them often, but they’re all near and dear to my heart. Necklaces from my husband. I finally asked him to stop getting me jewelry, because I feel like these three are so lovely and I want to get as much use out of each one as they deserve. The only other ring I own aside from my wedding ring. Also a gift from my husband, and I don’t think I need to tell you why I love it so. It’s precious. A necklace from my grandmother – I can’t bear to part with this because it brings me great joy to know she picked this out for me years ago. I bet she doesn’t even remember this, but I do. And I cherish it. Years ago, I couldn’t fit all my jewels (mostly cheap plastic costume-y pieces) into a large jewelry box. They would get tangled and broken and I still wouldn’t get rid of them. Even when they were beyond repair. Jewelry is small, but it can add up. Allow yourself the luxury of opening up an uncluttered jewelry box filled with only the pieces you absolutely adore. You deserve it. Immediately toss broken, tangled or otherwise unusable pieces. Toss uncomfortable earrings. They’re not worth it, and you know it. Look at the pieces objectively. Are they even practical? Do they have real-world use? Toss or donate pieces you haven’t worn in over a year. Don’t worry about what’s in style – just keep what you like and what you actually wear. Sentimental items can be hard to part with, but they can really build up if we don’t watch it. If you wear it regularly, keep it. If you don’t, consider selling it (if it’s valuable), gifting it or donating it. What’s most important to remember is that getting rid of the piece doesn’t mean the memories go with it. You don’t have to hold on to things – even small things like jewelry – to remind you of important people, places and events in your life. What’s in your jewelry box? This entry was posted in Home, Minimalism and tagged fashion, get rid of stuff, jewelry, lifestyle, minimalism, simplify. Bookmark the permalink. I love, love, love this post. I see so many minimalists talk about jewelry with the attitude that you just shouldn’t own anything. You’ve got a very reasonable collection. It seems like just the right amount! I own a gold chain and a silver chain, and about 10 small charms for each, which I swap out. I got my ears pierced at 28 so when I went to get earrings I did it right — I bought a few earrings, got EXACTLY what I wanted, and got quality stuff that I love. In total I own about 20 pairs. My bridal set is where things get a little crazy: I’ve got three engagement rings! One is the diamond I inherited from my grandmother but prefer not to wear because it’s just too much bling for me, one is the CZ ring that my husband bought when he found out that I wouldn’t wear my grandmother’s bling while he had something more modest made up — and that’s what I wear, along with a plain gold band, every day when I’m not sailing. Thanks Zoe! I’m glad it resonated with you. I love the idea of interchangeable jewelry – what great multi-purpose pieces. Getting ears pierced at 28 is awesome since you can show restraint – looking back, I don’t even remember when or why I got my double piercing. That ended up doubling my earring collection, which is madness. I don’t think that the bridal set is crazy at all! Since I got my engagement & wedding rings soldered together, I only have one piece but sometimes (if traveling or doing something that could endanger my ring) I wish I had a band on its own. I think the next piece I get will be a super-simple, inexpensive band (from Etsy probably) to be a placeholder for when I don’t want to risk having my full set on my hand. I’ve been working on going through my jewelry lately too, particularly earrings. I have SO many pairs, but I always seem to go back to the same few timeless pairs. I am slowly getting rid of them. I finally just got rid of all of my bracelets. They were so pretty, but I finally had to accept that I don’t like to wear bracelets and can barely tolerate a Fitbit on my wrist! Slowly but surely getting down to just the ones I love the most. I hate that you called me out on this! Ha ha! I am so guilty of being a jewelry hoarder when I have done such a good job paring down everywhere else. I also have a few engagement rings: my real one, and 2 CZ ones that I got from Berricle because I thought I would get sick of always wearing the same thing. Well, guess what? I tend to pretty much wear just my wedding band anyway, only adding my (real) e-ring on special occasions. I have bracelets that I love but can’t put on myself, so I don’t wear them. I have necklaces and earrings that I’m allergic to that for some reason I still cling to. Thanks for writing this! I definitely need to go through my hoard and send some things to other, loving homes! Ha! It’s nice to know that people share my experience – hoarding jewelry is so so so easy to do. And overbuying is easy too since gorgeous jewels can be inexpensive. I hope that you find it relieving – I know that when I ditched all the random stuff in my jewelry box, I started appreciating the things I had a lot more. It’s just so nice to not have to untangle things all the time. Good luck & thanks for commenting!